We would like to introduce ourselves as the importer and supplier of MULTIMAT (Sterylab, Italy). 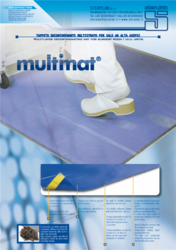 Multimat is an antimicrobial mat, which can be used in in I.C.U/ Operation theatre, Emergency room and Patient ward, etc. We would like to introduce ourselves one of leading importer and supplier of multimat ,Multimat is an antimicrobial mat ,which is used in I.C.U/Operation Theatre, Emergency Room And Patient Ward. MULTIMAT demonstrated a high capability to reduce the bacterial load for a large spectrum of bacteria involved in the aetiology of HI. The results obtained in this vitro study suggest that MULTIMAT is a very useful tool to reduce the load of pathogenic micro organisms in all the locations where a decreased presence of bacteria and fungi is required to maintain the diffusion of “environmental borne” infections under control. Owing to the presence of our expert team members, we are engaged in catering a wide range of Multilayer Mat under our product range. Our offered range of Multilayer Mat is available at market leading prices along with unmatched quality. Our entire product range is processed under the strict supervision of experts, using the high grade technical skills and advanced machinery and other related equipments. 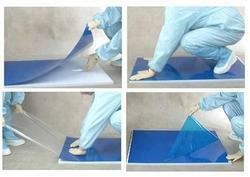 Sticky Mat is one of best way to protect your hospital(ICU/OT,Surgery room,etc.) clean and germ free. 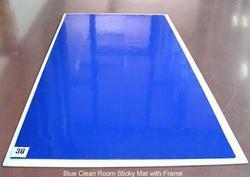 Sticky mat offered by Bio-X at very cost effective rate, easy to place and use in the hospital . It is available in blue colour size-60X115 cm which can be used singularly or multiple. It can be easily placed down on the floor even under the open side or on its specifically designed metallic frame (PAL) to allow its movement during floor washing. Antimicrobial & anti fungal chemical agent (Benzoisothiazolia-3-one) retain and kills all the pathogens carried by shoes soles and trolley wheels. We are happy to introduce ourselves one of leading supplier and trader of Hospital Sticky Multimat. It can be used in in I.C.U/ Operation theatre, Emergency room and Patient ward etc. STERYLAB produces Hospital Multimat, the most advanced cheap multi-layered mat available in the market to date, easy to place and use, always effective. Hospital Multimat is composed of 30 adhesive, plastic thin sheets, for a total thickness of mm 2.40. Hospital Multimat can be placed down on the floor even under the open side or on its specifically designed metallic frame to allow its movement during floor washing. Biox is one of leading supplier of Adhesive Antimicrobial Mat from Sterylab,Italy. Our Adhesive Antimicrobial Mat is mixed with a special antimicrobial and antifungal agent, Benzoisothiazolina-3-one.It demonstrate the high level of capability to kill the germs and bacteria carried out by the shoes,slippers in hospital rooms(O.T,I.C.U,X-ray room, cathelab,).Antimicrobial mat is best way to maitain hygenic environment in hospital.It will be available at best competitive rate .It is not only sticky mat but also it kill germs and bateria. 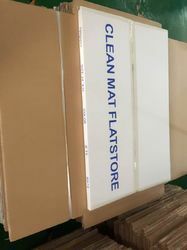 Sterylab produces Antifungal Mat, the most advanced cheap multi-layered mat available in the market to date, easy to place and use, always effective.Antifungal Mat is used for surgery rooms, I.C.U. units, whenever asepsis required. Antifungal Matis composed of 30 adhesive, plastic thin sheets, for a total thickness of mm 2.40. Antifungal Mat can be placed down on the floor even under the open side or on its specifically designed metallic frame (PAL) to allow its movement during floor washing. 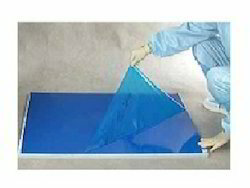 Blue coloured, Antifungal Mat has the adhesive mixed with a specil antimicrobial & antifungal chemical agent (Benzoisothiazolia-3-one).Its antimicrobial action destroys pathogens carried by dirt and debris (up to 100 millions bacteria per gram). The blue colour shows the trapped dirt till the top sheet is used. We offer a wide range of Dust Control Sticky Mats,These sticky mats quality assessed and are at par with industry defined safety standards. Each sticky mat has multiple layers of polyethylene films coated with custom high tack adhesive laminated together into a stack. As the top layer becomes soiled it can be simply peeled off to expose the next clean sheet of sticky mat. 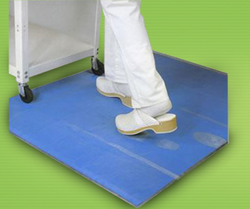 Dust Control Sticky Mats are fabricated with special materials Antimicrobial and antifungal chemical that are capable of preventing any kind of dust particles, which enter the clean rooms through the foot soles and trolley wheels. These mats can be placed at the entry of the rooms to block the dust particles at the entrance itself. We are a reliable manufacturer and supplier of finest range of OT and ICU Mats including Multilayer Mat, Antimicrobial Mat, Hospital Multimat, etc. The range is used in hospitals' emergency rooms, ICU, wards or operation theaters. This is an antimicrobial mat for warding of microbes from germinating into the area. The mat is made of foam, thin plastic sheets, or in metallic frame. The dust or dirt collected from outside may carry microbes or bacteria that may spread infection among the patients. Hospital Multimat traps the dirt and prevents the microbes from spreading inside. The Multimat has been designed for total protection from pathogen carriers. We would like to introduce ourselves one of leading importer and supplier of multimat ,Multimat is an antimicrobial mat ,which is used in I.C.U/OPERATION THEATRE,EMERGENCY ROOM AND PATIENT WARD. Bio-X offers a new way to keep hospital free from Infection caused by bacteria and germs,carried out by(Doctors.Patient,Nurses) though their Shoes, trolley, slippers. 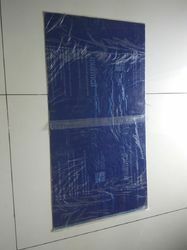 Sanitizing Antimicrobial Door Mat is one of handy tool which not only help to keep the floor clean but it contains special antimicrobial and antifugal chemical agent(Benzoisothiazolia-3-one) which kills bacteria and germs.The 30 layer sticky mat comes in blue colour with thickness 2.4mm.It can be placed down on the floor or on specifically designed metallic frame. BIO-X is one of the leading importers and suppliers of Clean room mats. The sticky mats are used in various places such as laboratories, pharmacutical companies, hospitals, clean rooms, medical device companies, diamond companies, factories etc. The sticky mat consists of 30 layers. It is available in blue colour having a size of 3' x 2'. We are the importers and suppliers of Antibacterial Sticky Mat in India. These mats are used to remove the dust from products, soles, wheels and other items. We would like to introduce ourselves one of leading importer and supplier of multimat ,Multimat is an antimicrobial mat ,which is used in I.C.U/Operation Theater , Emergency Room , And Patient Ward. MULTIMAT demonstrated a high capability to reduce the bacterial load for a large spectrum of bacteria involved in the aetiology of HI. The results obtained in this vitro study suggest that MULTIMAT is a very useful tool to reduce the load of pathogenic micro organisms in all the locations where a decreased presence of bacteria and fungi is required to maintain the diffusion of “environmental borne” infections under control. Bio-X offers a new way to keep free from infection caused by Bacteria and Germs,carried out by (Doctors ,Patient,Nurses) though their shoes, trolly, slippers.Sanitizing Antimicrobial Mat is one of Handy Tool which not only help to keep the floor but it contains special antimicrobial and antifugal chemical agent ,which kills bacteria and germs.The 30 layer sticky mat comes in blue colour with thickness 2.4 mm.It can be placed down on the floor or on specially designed metallic frame. STERYLAB produces MULTIMAT, the most advanced cheap multi-layered mat available in the market to date, easy to place and use, always effective. MULTIMAT is used for surgery rooms, I.C.U. units, whenever asepsis required. MULTIMAT is composed of 30 adhesive, plastic thin sheets, for a total thickness of mm 2.40. MULTIMAT can be placed down on the floor even under the open side or on its specifically designed metallic frame (PAL) to allow its movement during floor washing. Blue coloured, MULTIMAT has the adhesive mixed with a specil antimicrobial & antifungal chemical agent (Benzoisothiazolia-3-one). 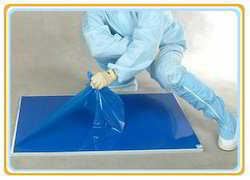 Nowadays Multi-layered mats are the best way to prevent contamination spreading into surgery rooms by the introduction of tracked-in, bacteria-laden dirt and debris.STERYLAB produces MULTIMAT, the most advanced cheap multi-layered mat available in the market to date, easy to place and use, always effective. 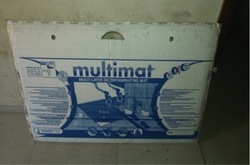 MULTIMAT is used for surgery rooms, I.C.U. units, whenever asepsis required. Its antimicrobial action destroys pathogens carried by dirt and debris (up to 100 millions bacteria per gram). The blue colour shows the trapped dirt till the top sheet is used. We would like to introduce ourselves one of leading importer and supplier of multimat ,multimat is an antimicrobial mat ,which is used in i. C. U/operation theater, emergency room and patient ward. Multimat demonstrated a high capability to reduce the bacterial load for a large spectrum of bacteria involved in the aetiology of hi. The results obtained in this vitro study suggest that multimat is a very useful tool to reduce the load of pathogenic micro organisms in all the locations where a decreased presence of bacteria and fungi is required to maintain the diffusion of “environmental borne” infections under control. Bio-x offers a new way to keep free from infection caused by bacteria and germs,carried out by (doctors ,patient,nurses) though their shoes, trolly, slippers. Sanitizing antimicrobial mat is one of handy tool which not only help to keep the floor but it contains special antimicrobial and antifugal chemical agent ,which kills bacteria and germs. 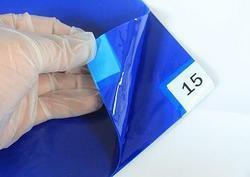 The 30 layer sticky mat comes in blue colour with thickness 2. 4 mm. It can be placed down on the floor or on specially designed metallic frame.